Franco Nero stars as an onion farmer who comes strolling into a dusty frontier town with his trusty horse, Archibald, that loves to bust gas and wear a straw hat to harvest his favorite vegetable on a spot of land. The only problem is an oil baron with a golden mechanical hand with spiked fingertips, Petrus Lamb (Martin Balsam), wants the rich yield of crude under Onion's fields by any means. Onion also has to contend with a corrupt sheriff and his two slightly fascist, pasty-faced right-hand men. With the help of a newspaper photographer (Sterling Hayden) and the two boys of the murdered farmer who owned the farm prior, Onion embarks on a journey of goofy fistfights with loopy sound effects, bicycle/horse chases with football motorcyclists, and slapstick wranglings involving onions as deadly weapons. You know, after reading several not-so-favorable reviews online, I was expecting far worse than what I got. Nero proves at turns he can be funny, charming, and the stoic badass we all love him for in this comedic spag western. Sure, the premise and characters are completely ridiculous, but the film is never boring and is fully aware it's all for fun. 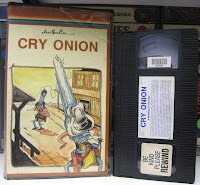 Onion just has to dubbed in English by Mason Adams; the voice of Smucker's Jelly. Who can't love a film with a lead that makes people pass out merely from his breath, loves to crush onions to extract juice, and hurl them with precision in barfights? Guido & Maurizio De Angelis provide a quirky soundtrack that's again far better than the content it's married to. This is a Castellari film that has alluded me so far. I hope it gets a DVD release in the states soon. Good to hear a positive review.